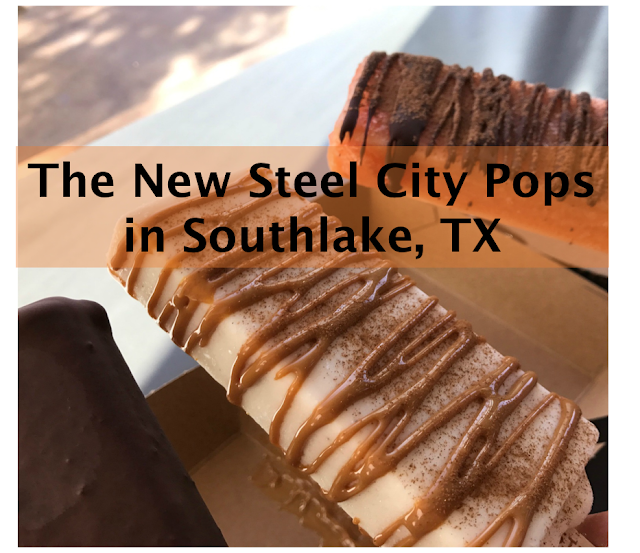 In today's post, I will tell you about the new Steel City Pops that opened in Park Village (Southlake). This trendy shop offers unique desserts and truly has something for everyone. There is a combinatorial explosion when you consider the different types of popsicles that may be combined with a variety of dips, dredges, drizzles, and/or dusts. We are convinced that life in our "Southlake Bubble" is now complete thanks to Steel City Pops! Let's start with the location. 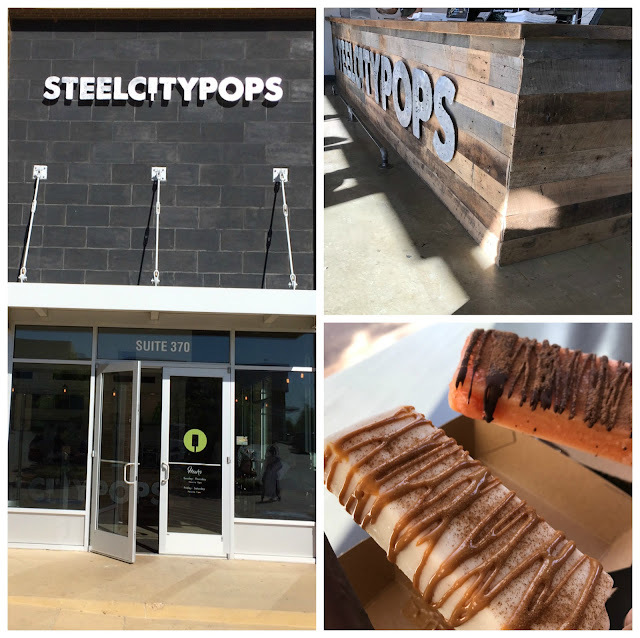 Steel City Pops is located next to Sur la Table and across from Modern Market in Park Village. You won't miss it as crowds of happy people typically sit outside to enjoy their treats. The menu includes a variety of popsicles that fall under three categories - Fruit, Creamy, and Cookie Pops. Something that I really like is that they use high quality ingredients and the menu offers transparency. One of my children has a food allergy, so the menu transparency is convenient. The way that is works is that you first choose your popsicle. Once you choose your popsicle, you may eat it plain or dip, dredge, drizzle, and/or dust it. While they give the option to order a plain popsicle, I recommend ordering a dip, dredge, drizzle, and/or dust because it is a fun part of the experience. Now, let's share some of the amazing treats that we tried! My favorite vegan option is the Avocado popsicle. This trendy popsicle contains: avocado, lime, organic cane sugar, and water. 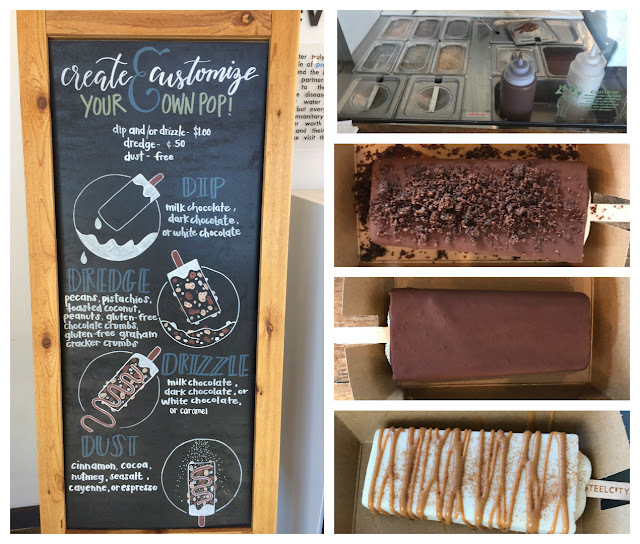 The staff told me that every dip, drizzle, dredge, and dust option is vegan with the exception of the milk chocolate and caramel. The photo below shows the avocado popsicle (1) dipped in dark chocolate, (2) plain, and (3) dipped in dark chocolate with the cayenne dust. They are all amazing, but my favorite combination is the avocado popsicle dipped in dark chocolate. It is the best vegan dessert in Southlake! The next photo is my husband's dream creation of a Lemon Cream popsicle dipped in dark chocolate. My husband is not big on desserts, but he reported that this was the most amazing popsicle that he has ever had because the creamy lemon and dark chocolate are rich and compliment each other well. He looks forward to visiting again. My 6-year old's dream creation is the Buttermilk popsicle drizzled with caramel and dusted with cinnamon. He was thrilled with his creation! He looks forward to visiting again to create a new "popsicle recipe". In summary, Steel City Pops is a family friendly shop that is perfect for our community here in Southlake. My family is already craving another visit! 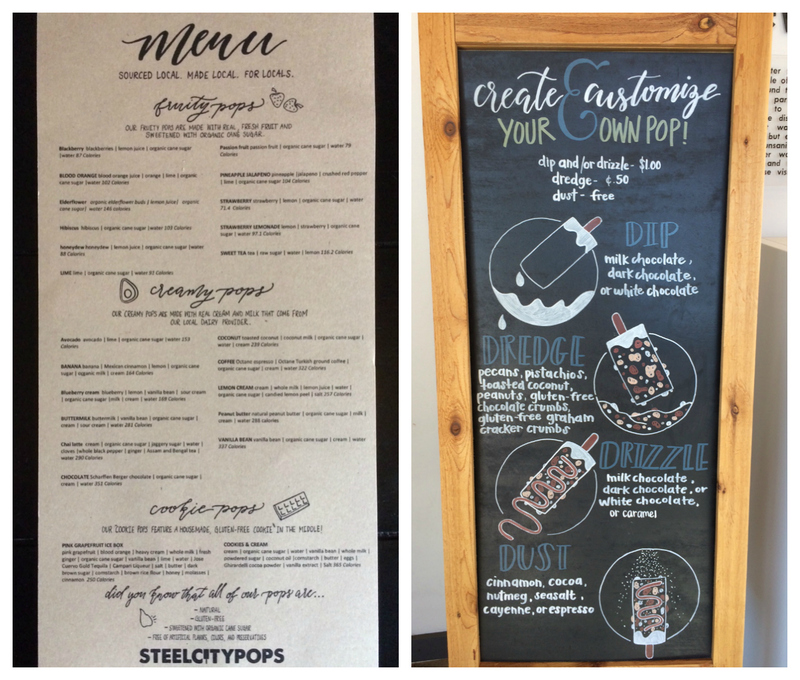 We hope that you enjoyed reading about our visit to Steel City Pops and that you have an opportunity to visit with your family. If you want to plan your visit in advance, you will find the menu here.